Bitter Melon, also known as Karela in India, Bitter Gourd is an herb that helps regulate blood sugar levels and keeps body functions operating normally. Karela comes from the family of Cucurbitaceae and its botanical name is Momordica Charantia. 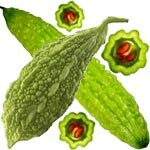 Karela contains Gurmarin, a polypeptide considered to be similar to bovine insulin, which has been shown in experimental studies to achieve a positive sugar regulating effect by suppressing the neural response to sweet taste stimuli. Bitter melon is one of the best vegetable-fruit that helps improve diabetic and toxemia conditions. Some have also believed that Karela, Bitter Melon not only aids and provides comfort or reduces the symptoms, it supposedly cures the sickness altogether. Karela is a bitter melon and is very rich in iron (Fe) content and has two times the beta carotene of broccoli, two times the calcium (Ca) of spinach, two times the potassium (K) of bananas and possesses vitamins C (ascorbic acid) and B1 (thyamine) to 3, phosphorus (P) and outstanding dietary fiber. At least thirty two energetic constituents have been recognized in bitter melon so far, jointly with beta-sitosterol-d-glucoside, citrulline, GABA, lutein, lycopene and zeaxanthin. Karela contains insulin and is very good for the liver. Karela is known for its anti tumor properties and it also inhibits various infections. It is jam packed with various beneficial active constituents. As the name implies, this vegetable is a melon that is bitter. The bitter melon is considered to be tonic, stomachic, laxative, stimulant, emetic, alternative and antibilous and it is these properties that make it so good in treating diabetes. This fruit is very efficient in treating rheumatism, gout and various lives and spleen diseases and conditions. It is also very beneficial in purifying the blood and dissipating melancholia. Karela is also unbelievably beneficial in cooling the body and suppressing skin related troubles as well as healing the wounds much faster. It normalizes the digestive tract and improves the peristaltic motions in the human body. It is efficient in regulating the urinary tract and regulating carbohydrate metabolism. There are so many different health benefits of bitter melon. First of all, it is very good for the treatment of diabetes and is very efficient in decreases the sugar levels in urine and blood. Karela is also very helpful in regulating the effect of sugar on the human body by suppression of the neural response to the stimulation of the sweet taste. It also has very potent lipogenic and antilipolytic properties and it is very efficient in purifying the blood. Bitter melon is excellent for the treatment of worm infestations and it stimulates the liver and the pancreas very efficiently. It is beneficial for the digestive tract and its purgative, emetic and anthelmetic properties come in very handy in treating jaundice and piles. It is also known for maintaining a healthy endocrine structure of the body. It should be taken two times a day, after meals. Karela deals with diabetes mellitus, piles, leprosy, various respiratory disorders, cholera, different types of infections, impure blood, numerous skin diseases and alcoholism. It also has very powerful purgative and anthelmetic properties. It is first and foremost a very good appetizer. Karela Juice is extremely supportive in metabolism of carbohydrate, this vegetable is also helpful in strengthening the immune system as it contains high mineral and vitamin content. It acts as a blood cleanser or filter, which helps eradicate infection and toxins we get from various microorganisms. Regular consumption of bitter gourd evades blood impurity and cools the body. It also helps in maintaining good and flawless skin. It helps relieve constipation, very useful in constipated stools and disease like hemorrhoids, fissures and fistulas. Help in destroying worms present in our gastro intestinal tract therefore works as deworming agent. It is known to help in some types of skin diseases; from the common ones like acne or black heads, to the rare ones like psoriasis. It contains anti-bacterial elements that effectively help in healing wounds. It relieves chronic cough because Karela also acts as an expectorant which aids in clearing the lungs. Patients with asthma are said to find relief in drinking teas made from Karela leaves. For the female population, it supposedly provides comfort during menstrual disorders. Pyorrhea is bleeding from the gums. Including bitter melon in the daily diet or having some of its juice every morning on an empty stomach helps to reduce this problem. For best results the diabetic patient should include Karela, Bitter Melon in his diet on a regular basis. The juice of bitter melon should be taken as the first thing in the morning on an empty stomach. You can even use it in powdered form either by adding it to the food you eat or simply by taking it with water. Apart from this decoction can also be prepared by boiling chopped bitter guard in water is equally effective. Karela, Bitter Melon also acts as a natural blood purifier, improves stamina and boosts energy - the prerequisite for the diabetic patients. Karela, Bitter Melon is also known to raise the number of beta cells in the pancreas and thereby improve the body's capability to produce insulin. Due to its cooling properties it is also helpful in skin related problems and also heals the wound quickly.